Edmund's dev blog for gay nerds: Free Meat Boy Comics! 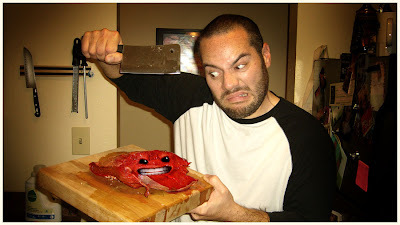 The week im giving away 5 comics (with bonus xmas prizes) to 5 lucky peopel who sent me images of themselves with something meat or meat boy related. The contest is simple, send us an image of yourself with something meat related, i'll use Mikes pic one more time as the perfect example. You can submit a link to us via twitter (http://twitter.com/SuperMeatBoy), or comment a link to your pic on this post. Another notable difference between replica Chanel watches and the real ones is the weight. After paying off bills, college tuition for the kids and gas anymore, who has the money to spend on an expensive Chanel Watches ? Although worth the price, you can expect to pay anywhere from several hundred dollars to thousands of dollars on a Replica Chanel .Many of us are not willing to drop that kind of money for an accessory that is not needed. However, with continuous advances in authentic jewelry crafting, the craftsmanship of replica jewelry has increased as well. While cutting the price in half and sometimes even more, Replica Chanel Watches are becoming increasingly similar to that of the authentic. Wow this is so comic, but also I liked the originality I saw in here, that man is amazing because sometimes we aren't able to make something similar. Excellent advice! you don't know how many marketers need to have these traits ingrained into them. Kudos!